Sixth graders from Tomahawk Elementary look at the virtual disection table, used by high school students in the medical health science program at the Center for Academic Achievement. But when she started talking about all the cool jobs there were in science, technology, engineering and math right here in Kansas City, the sixth graders sat up a little straighter. Their eyes widened when Lavallee said some of them might even have jobs that haven't been invented yet. Across the metro, school districts are weaving career exploration into the curriculum, starting when kids are really young. Shawnee Mission is no exception. The Center for Academic Achievement is where high school students take career exploration classes, but it’s not uncommon to see much younger students there. Principal Ryan Flurry said he’s “lost track” of how many tours he’s given to elementary students this school year. He has a whole spiel. Flurry told the sixth graders that college was expensive. Really expensive. Too expensive for them to waste time figuring out what they wanted to be when they grew up. They could figure it out now, and when they were in high school, they could take classes at his school, and maybe earn some scholarship money. In fact, one of his students had just won more than $30,000 at a culinary arts competition. “Whoa,” a sixth-grader whispered, impressed. 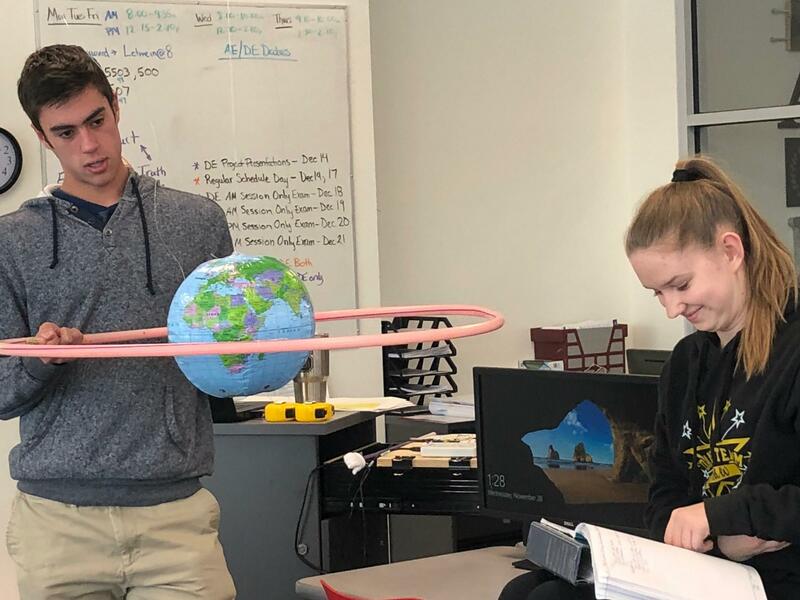 High school students explain how satellites stay in orbit using an inflatable earth and a hula hoop. Now that Flurry had them hooked, they went to a classroom upstairs, where high schoolers in the aerospace engineering program were learning about satellites. They dropped into the animation lab. The sixth-graders had yogurt ruined for them by the biotechnology teacher, who told them it was bacteria. And they got to see a dissection in progress on the virtual cadaver table. The tour impressed sixth-grader Ainsley Pyle, who wants to be a trauma surgeon when she grows up. It’s important to get students who want to enter STEM fields into the pipeline as soon as possible. A student who wants to be a doctor someday needs four years of high school math and science, and most districts have programs that will allow motivated students to graduate with an industry credential or college credit. Taking elementary students on tours of the career center lets them know it’s an option when they get to high school. Even kindergartners and first graders get to go on tours. All Shawnee Mission elementary school students get STEM instruction. A few schools, like Tomahawk, have STEM teachers. Tomahawk students get math and science instruction in their homerooms, then come to Lavallee’s class to dive deeper into STEM topics and do more experiments. Third-graders use their iPads during a Project Lead The Way lesson on how airplanes stay up. Recently she taught third-graders about flight. “They just glide,” third-grader Jackson Gentry said, eager to build and test his own glider the next time they had class. Math is Jackson’s favorite subject. Last summer, Lavallee got a grant to learn about STEM careers in Johnson County. The students get excited whenever professionals come to Tomahawk to talk about what they do for a living. This week KCUR is publishing stories about career and technical education. You can read more stories about how schools are preparing students for the jobs they’ll have after graduating here.